I’m normally the pessimistic type when it comes to football, maybe being a Swindon fan since the days of McMahon has driven that into me, but has Paolo and his current squad tipped me over the edge in optimism? I predicted, in my blogs looking at the League One title and playoff race, that with the stats on offer Swindon have a strong possibility of making the top two. This would be ahead of Brentford, a side with two defeats in 21, current table toppers Tranmere and 2nd place Doncaster who lead the rest of the pack by seven points. We’ll start with the stats as I’ve done with the previous sides to help mould the situation in our minds. Swindon’s defence built a reputation during their time in League Two by conceding only 8 goals in 23 home games and keeping 26 clean sheets in the league. This season it’s been strong once again and has been proved as one of the best in the league by limiting their opponents striking threat. Town have conceded fewer than their promotion rivals with 19 goals and the next joint lowest being Brentford and Doncaster who’ve let in 25. That in itself tells you the story but it gets better. Alan McCormack and Co have only conceded 8 home goals in 14 games with the next best home defence being Tranmere on 11. Away from home it’s nearly as good by being joint second best on 11 behind Doncaster. The stats show that Town limit their opponents to the least amount of shots per game than any other in League One and are in with the other top six teams for shots faced per goal with 8/9 shots per game. 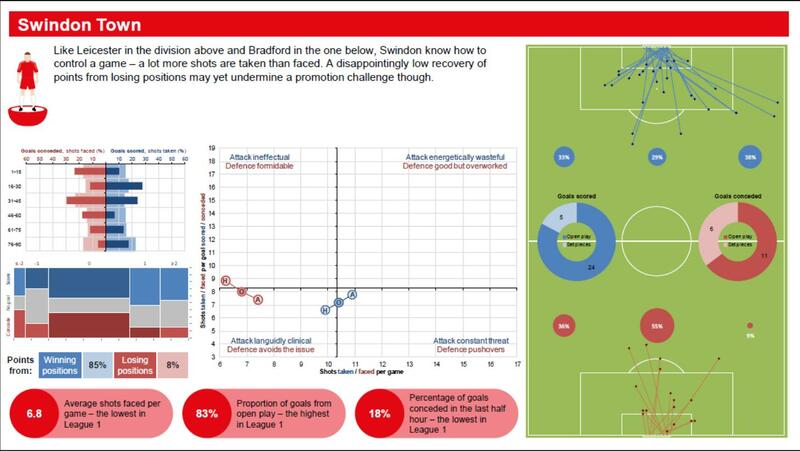 To be blunt, Swindon don’t allow as many shots as others do on goal and concede at a similar rate to their rivals meaning they will be conceding less goals per game on average. The weakness of our side since Di Canio has taken charge is the amount of chances we create to goals ratio. In the last month that problem has obviously been turned upside down and kicked out of England with 19 goals in six games but previously it was a cause for concern which could hinder a promotion push. Let’s hope we don’t return to those days. In the league table Swindon are the division’s top goal scorers which is obviously helped immensely by our recent 5-0, 5-0, 4-0 victories. This run has helped to hide our earlier league form in attack as we have now notched up 30 goals in 14 games at The County Ground. Away from the green grass of SN1 we’ve managed 17 in 12 which isn’t bad and puts us joint 3rd out of the top six. The stats once again put Swindon in a good light and highlight the strength we have in attack through the midfield and the chances we create. We are seventh in the table for most shots created per game but have one of the best conversion ratings. On average we create 11/12 shots per game and need 6/7 shots per goal scored. 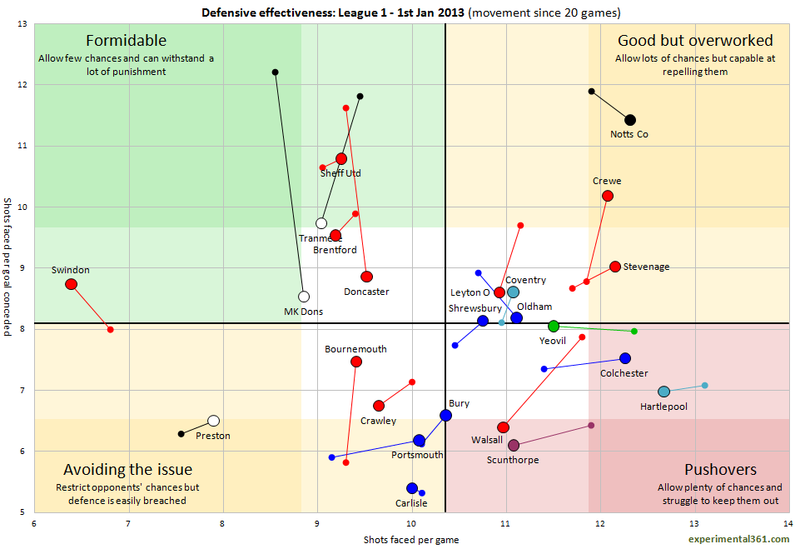 We are in a top 9 spot for shots taken per goal which is slightly surprising considering our earlier lack of consistency in front of goal but as already explained, the strength of our build up play shines through with only Coventry creating more chances per game. Hopefully all those numbers and stats haven’t hurt your head too much before I’ve explained why I think Swindon can now push on to claim a top two spot. Anyway, Swindon are currently at the beginning of what will hopefully be a good run, much like last season which saw us cement a place in the promotion spots.It’s been a good December and January for Paolo’s Rottweiler’s with the last defeat coming at Notts County on November 24th. In their previous seven games they’ve walked away with 17 points from a possible 21 to put them third but still seven points behind the leading front two, albeit with a game or two in hand. The next four games, which by the end of we’d be level with the rest of the top six, could prove pivotal at the end of the season as it could either further enhance our confidence or it could start a slope in form. Any set of games could but these ones will be particularly tricky with four in a row away from the County Ground starting with table toppers Tranmere, then games v Leyton Orient, Crawley and Colchester. Every game from now till the end of the season is big but three points at Prenton Park could be the start of another level of confidence. It would obviously help in the league and close up the seven point gap but also an away win against 1st place, following the 5-0 thumping they received over Christmas, has to give the players belief of top two rather than playoffs. Continuing to look at the fixtures and it makes for interesting reading. We have 11 games away out of the 19 games left this season and if away games weren’t already hard enough, Swindon will have to be at their very best with trips to the rest of the teams in the top six: Tranmere, MK Dons, Brentford, Sheffield United and Doncaster. 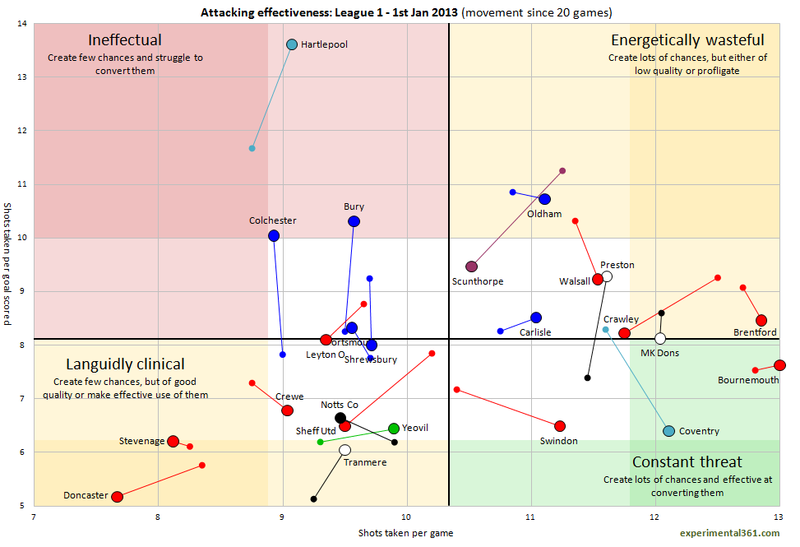 This does put Swindon at a disadvantage but our away form has been the more consistent over the season. Town have collected 21 points on the road this season from a possible 36 which isn’t a bad return but it’s hard to compare with opposition sides due to the fact we’ve played 2/3 less games which will be evened out in the coming fortnight. These away games will most likely decide our fate as by losing those and giving your rivals three points to pull ahead of you could leave Swindon in 5th or 6th, but, take some vital points from these grounds and we’ll be pushing the top two. At SN1, Swindon has eight matches left this season and they are all against sides that are currently 10th or below. Over the season our home form hasn’t been incredible but in recent weeks it has been. If we can keep that up, there’s no reason why we can’t be cocky and expect 24 points from these games. The base to the rest of the season has to be built at The County Ground. Drop any points at home and they’ll need to be made up on our away trips where just a point may be seen as invaluable. The fixtures on paper may be against us with several tough away games but the stats from the last 27 games say we will be up in the top two or thereabouts. We are the division’s top scorers, concede the least amount of goals, create the second most amount of chances per game and are one of the most clinical finishers in the league. Stats can say everything about the past but it’s on the pitch in the coming months that matter. It’ll be all about confidence and consistency. Earlier in the season consistency was the issue but in recent weeks we’ve hit a run that has brought some brilliant spells of football. If we can play to our best and keep up those standards, which Di Canio will most likely demand, then I don’t think there is a better team in League One. Obviously that’s said without knowing much about opposition sides but Town don’t need to go into games worrying that they’ll be outplayed instead they can be confident and play their game. Town have the squad, have the confidence in their starting eleven and it will be down to how the game plan is implemented on the pitch and if we can put away our chances rather than having ‘one of those days’ in front of goal. Keep up a good momentum, even during those big games, and I think other teams will slip up with Town hitting a great run of form which should be helped by ‘easier’ fixtures at home, not that any game is ‘easy’. It’s all if’s and buts at this stage but we have every right to be confident behind a top two dream. However, it’s not what we should be demanding.